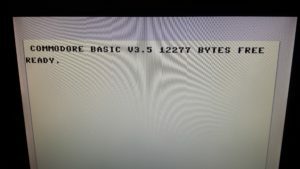 As the Commodore 16 is in the basic the same as the Plus/4. This also means that the memory part is almost the same. The only difference is the memory chips. on the Commodore 16, there are two 4416 chips, that both are 16kb x 4 bits. they are connected to the address bus by 2 multiplexers. 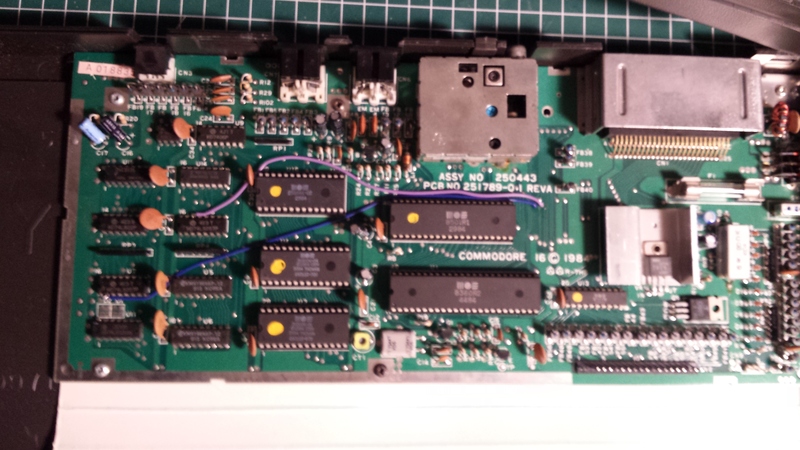 On the Plus/4 this is almost the same, but the 4416 chips are replaced by 4464 chips, that both are 64kb x 4 bits. But uses the same multiplexers, only the 2 upper address lines A14 and A15 are not connected. 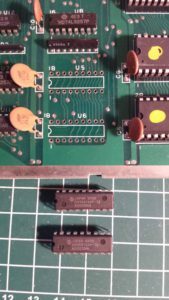 So to upgrade the Commodore 16 to 64Kb, we need to replace the two 4416 chips by a 4464 chips and add the two address lines to the multiplexers. 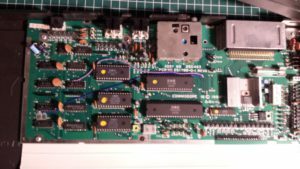 First we remove the two old memory chips (U5 and U6). I carefully de-solder them from the board as I have a de-solder iron, but as they are not needed afterwards, you can also cut the legs, and remove the legs one by one. 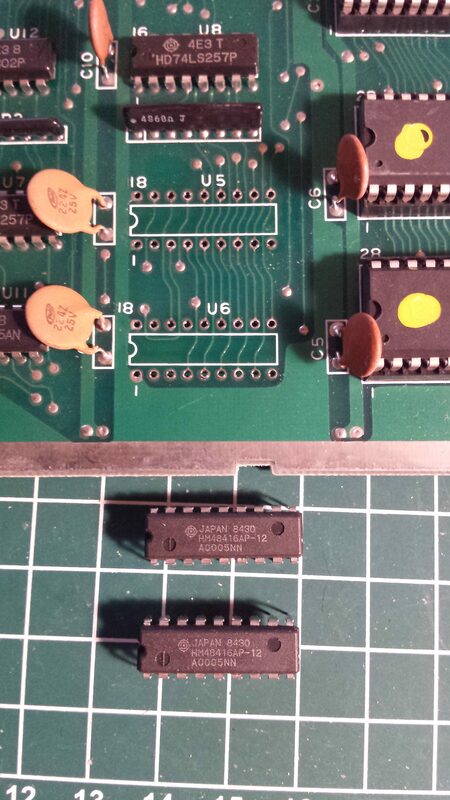 Then place the 2 new 4464 or equivalent chips on the board, I didn’t use any chip sockets as I didn’t had them. 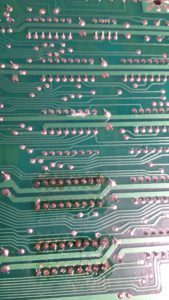 Inspect your work for short circuits and correct chip orientation. 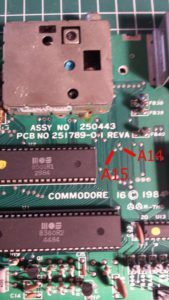 Power up the Commodore 16, there should be no change as the address lines are still not connected. If power up fails, check your work again. The pins of the multiplexers that need to be connected to the two address lines are connected to the 5 volt line. So we need to disconnect them. 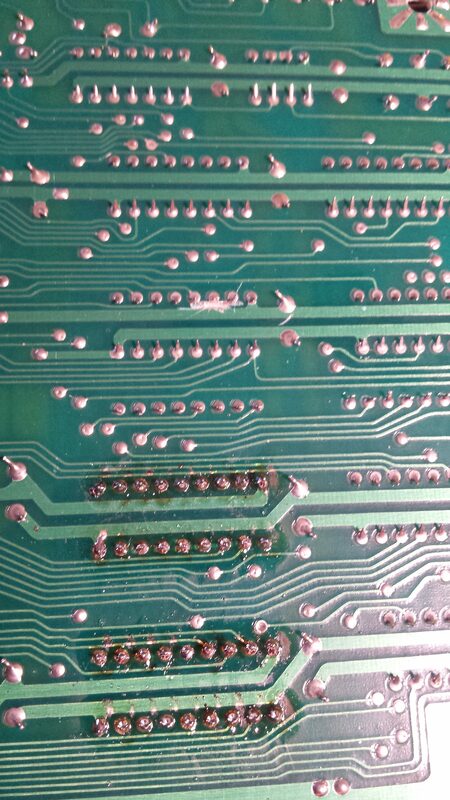 On U8 I cut the trace on the under side of the circuit board. 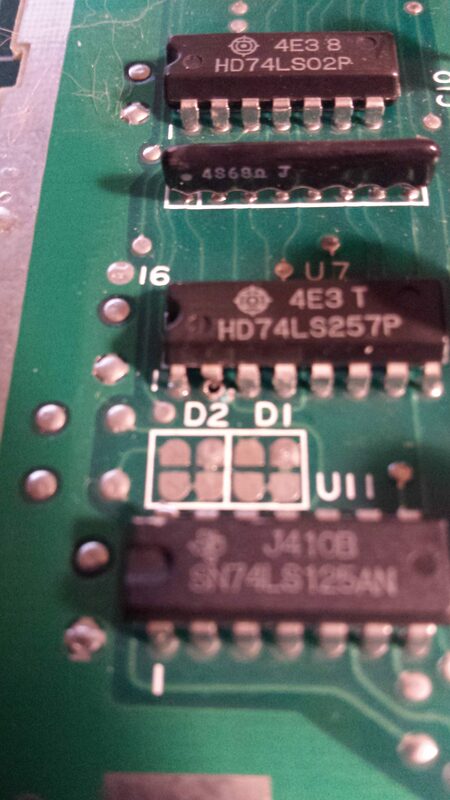 On U7 I cut pin 2 and remove the pin from the circuit board. 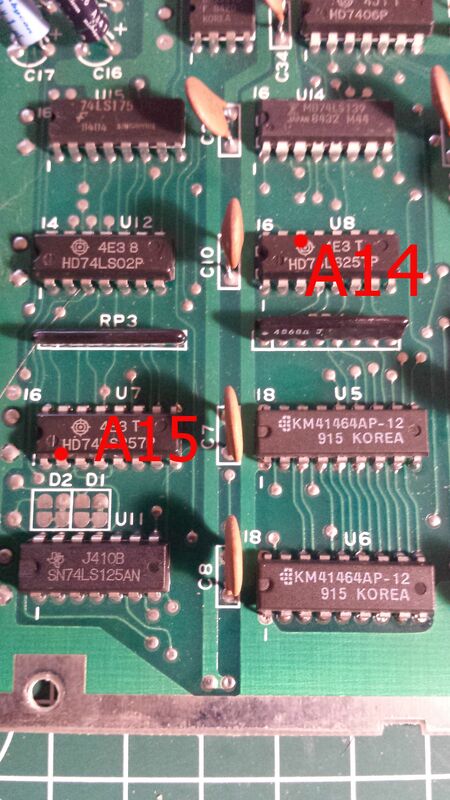 Now I connect the address lines A14 and A15 to the correct pins on the multiplexers. The A14 and A15 can be found on the CPU 8501 or 7501 at pin 21 and 22 or at the via’s like I used near the CPU. Double check your work, make sure the pins are really disconnected from the 5 volt line. 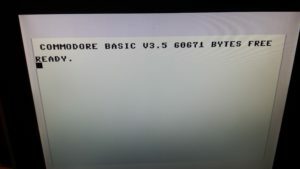 Connect the Commodore 16 to the power and video and check if the startup screen shows the “new” amount of free memory. If not, check your work again and correct your work. 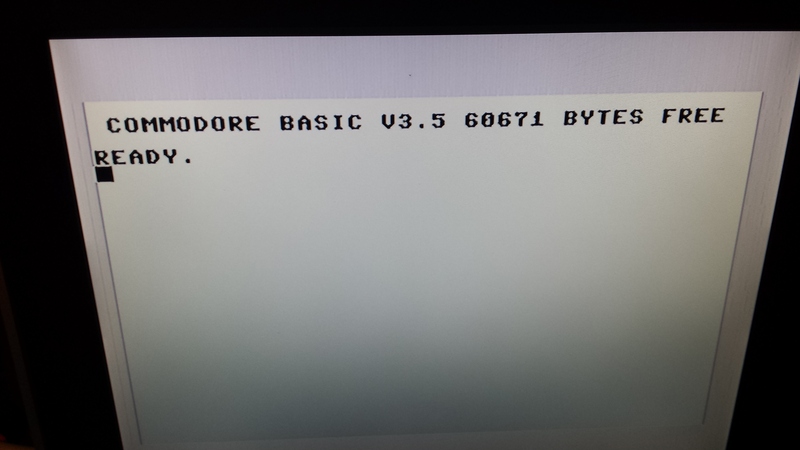 Reassemble the Commodore 16, And you now have a Commodore 16 with 64 Kb. As reference I added the mod to the schematics.